Not too long ago reader Robb Foster posted a comment with a link to the on-line video, Ribbon of Sand -- North Carolina's Outer Banks. It is a beautiful video with stunning images of North Carolina's coastal islands, especially Portsmouth Island and Core Banks. The video is almost 27 minutes long, so you might want to open the link above when you have enough time to watch the entire episode. This month's Ocracoke Newsletter is about the 1977 recording of traditional Outer Banks folk music. You can read the article here: http://www.villagecraftsmen.com/news032116.htm. Yes, this really is an Ocracoke scene...from 1972. 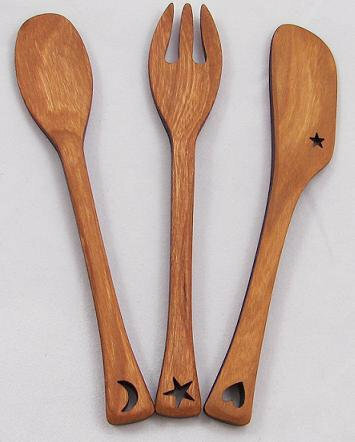 We had recently returned from working on Rocky Boy's Indian Reservation in north-central Montana, and decided to sell a few craft items on Ocracoke during the summer season. 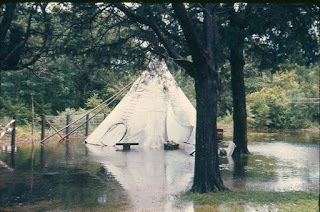 This tipi housed our nascent craft shop that morphed into Village Craftsmen just one year later. As you can see, heavy rains caused some problems in those days. Our current wood-frame building is much more practical as a craft gallery! Do any of our readers remember the tipi? The following photos are courtesy of Chester Lynn. 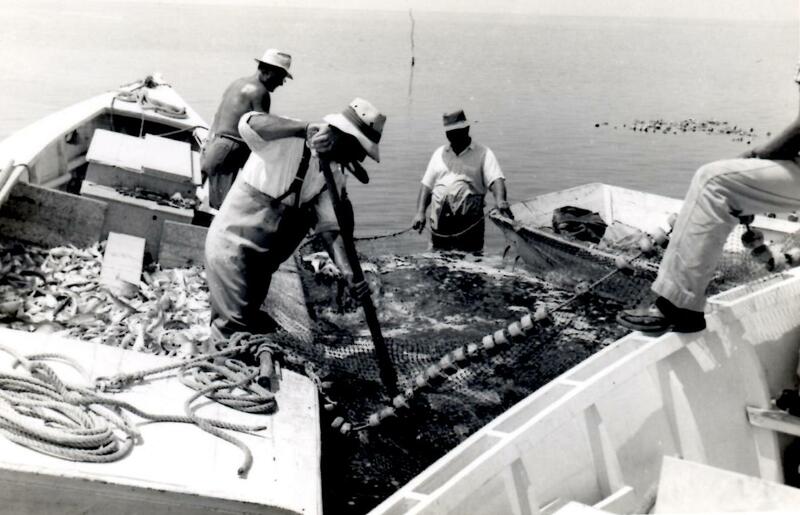 They show several Ocracoke men mullet fishing in Pamlico Sound a half century ago. The following article from the North Carolina Maritime Museum in Beaufort explains the process of "Stop Net Fishing" for mullet from the ocean beach in North Carolina: http://ncmaritimemuseums.com/wp-content/uploads/2015/04/Stop_Net_Fishing_for_Mullet.pdf. 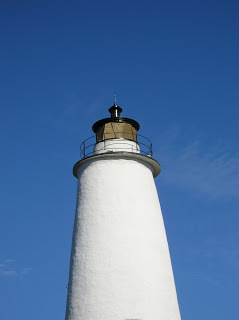 One of Ocracoke's more unusual names is Zora Babel (Babel is pronounced with a long a). This is a traditional man's name in the Gaskins family. 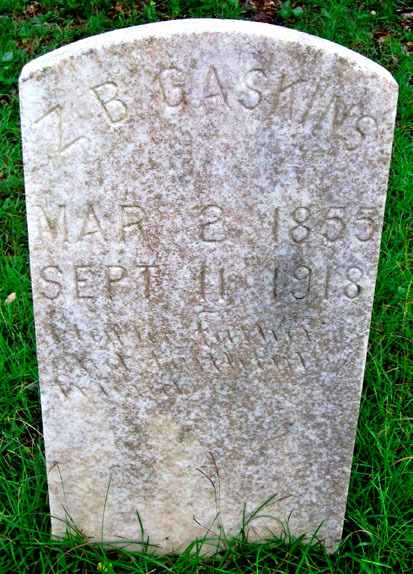 The earliest reference I have been able to find is for William Zora Babel Gaskins (b. 1831) who was married to Mary Elizabeth Howard. 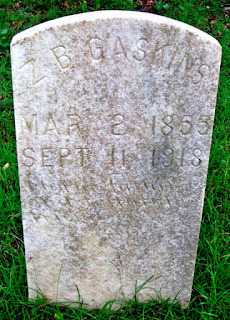 The last Ocracoke native I can think of with this name was Zora Babel Gaskins (1932-2008). I believe the name derives from Zerubbabel, a prominent character who is mentioned numerous times in the Bible. He was a governor of a Persian province, and led the first group of Jews who returned to Israel from the Babylonian Captivity between 538 and 520 BC. The name is from the Hebrew language, or possibly from the Babylonian language. Zəru Bābel in Babylonian means "Seed of Babylon." Here is one biblical reference...Zechariah 4:9: “The hands of Zerub′babel have laid the foundation of this house; his hands shall also complete it." In 1879, the Annual Report of the United States Life-saving Service called for the provision of draft horses at Life-saving stations on our coast. The appeal was repeated regularly. The following excerpt from the 1886 Report explains the urgent need. The USLSS was established in 1871. Horses were eventually employed beginning sometime in the late 19th century. "Another urgent requirement...is the provision of horses. The lightest burden of apparatus or life-saving appliances needed at a wreck is at least a thousand pounds, and at present...this has to be drawn by men. 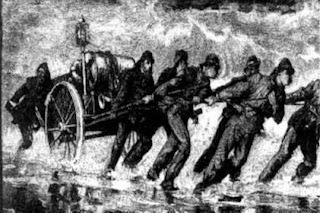 It is probable that to fully realize the heavy task involved it would be necessary to actually see with the eye the group of seven surfmen harnessed to the loaded cart, violently tugging in oblique positions, almost inclined to the ground under the strain of the burden, as they toil forward to the scene of the shipwreck. "It must be borne in mind that their load has often to be dragged through a slough of wet sand, against the stress of a winter gale, and that the journey will generally vary from one to three or four miles from the station [on Ocracoke Island the journey sometimes amounted to six or eight miles!]. Hence they must arrive seriously fatigued at the point where the severe labors of the direct operations at the wreck are to begin, and where they need their freshest energies. Equally bad, owing to the circumstances of their necessarily plodding progress with their grievous load, is the delay involved in reaching the wreck, a speedy arrival at which is so obvious a necessity that every one could wish that the rescuing party might come tearing along the beach at a gallop, with the speed of an engine racing to a fire." Robert L. Payne, in his 1985 book, Place Names of the Outer Banks, lists many references to Ocracoke. One is "Ocracoke Landing -- a former landing [a place where a ship or boat was loaded or unloaded] in Hyde County, Ocracoke Township at 35° 09' 20" N 76° 00' 35" W and located but not named on Chart 11550. The landing was in Pamlico Sound, 2 mi. (3.2 km) north of the village of Ocracoke." Payne adds this historical note: "The landing was actually the hulk of a sunken ship where boats anchored to transfer goods for the village of Ocracoke. The site was used for only a short period of time. 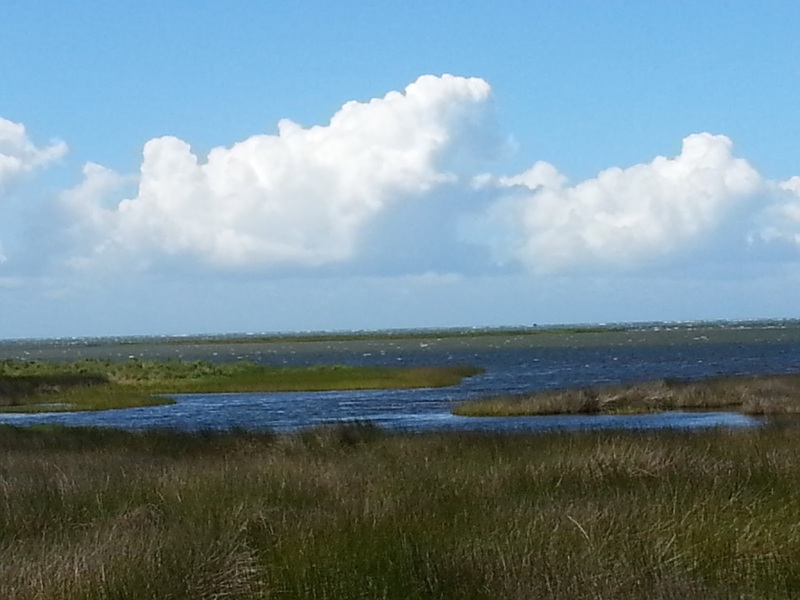 Today Big Foot Slough Channel extends south from here." Below is an old photo of the Ocracoke Navy Base. It was located where the National Park Service Visitors Center is situated today. I have added three arrows and text boxes to help viewers understand the orientation. The NCCAT building (the former US Coast Guard Station) is in the upper left; the pre-WWII Coast Guard Station (no longer extant) is to the right of the NCCAT building; and the large cylindrical water cistern (the only other structure still remaining) is slightly above and to the left of the center of the photo. A small area of Pamlico Sound is visible at the top of the photo. Silver Lake harbor is off the picture, on the left. Click on the photo to view a larger image, and to read the text. 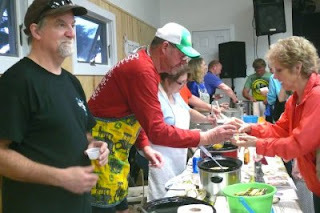 This coming Saturday, March 26, is the date for Ocracoke's second annual Clam Chowder Cook-off. This benefit for the Ocracoke Child Care will take place from 11:30 a.m. to 2:30 p.m. in the Ocracoke Community Center. Last year eleven island cooks participated, and more than 160 people sampled the chowders, and voted. Everyone is invited to participate -- individuals, businesses, organizations, restaurants, and amateur & professional cooks. There are two categories: traditional Ocracoke style (the only ingredients allowed are clams and their juice, water, potatoes, onions, salt pork or bacon, and salt & pepper), and non-traditional (this includes the addition of any other ingredients, although pepper vinegar and hot sauce may be used as condiments with traditional or non-traditional chowder). Ocracoke artist, Susan Dodd, has created “Golden Clammy” trophies to be presented to the winners. 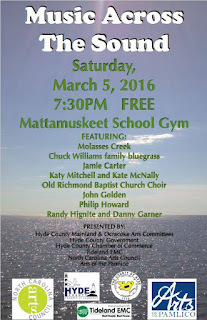 All proceeds from the event will benefit Ocracoke Child Care. This month's Ocracoke Newsletter is an article about a recording of traditional folk music of the Outer Banks. 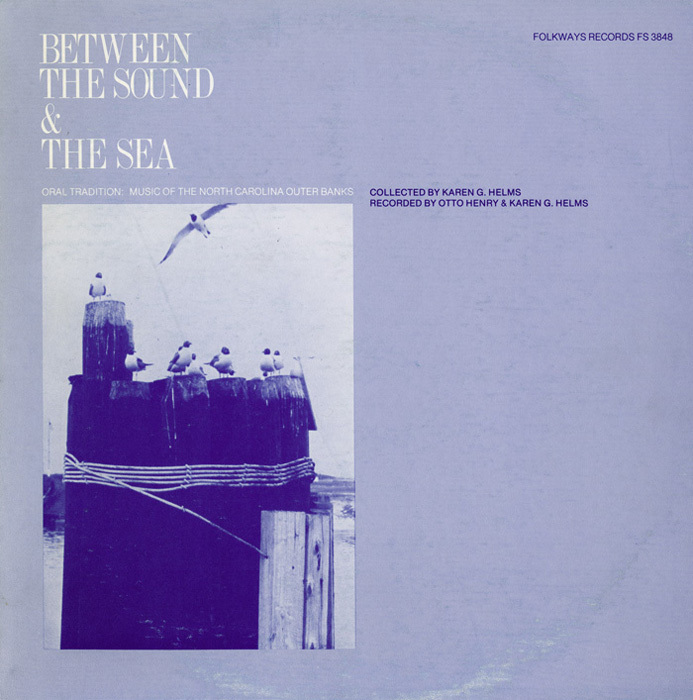 Compiled by Karen Helms in 1977, the album, Between the Sound and the Sea, features five native Ocracokers. They are Elizabeth Howard, Edgar Howard, Lawton Howard, Maurice Ballance, and Jule Garrish. You can read the article here: http://www.villagecraftsmen.com/news032116.htm. Village Craftsmen is open for the season beginning today at 10 am. When you are on the island be sure to take a leisurely stroll down historic Howard Street. Notice the centuries-old cottages, the majestic live oaks, the water cisterns from a different era, and the small family cemeteries (5 generations of Village Craftsmen's owner, Philip Howard, are buried directly across the sandy lane). The friendly folks at Village Craftsmen will be waiting to welcome you to the island and to our quiet and secluded area of the village. 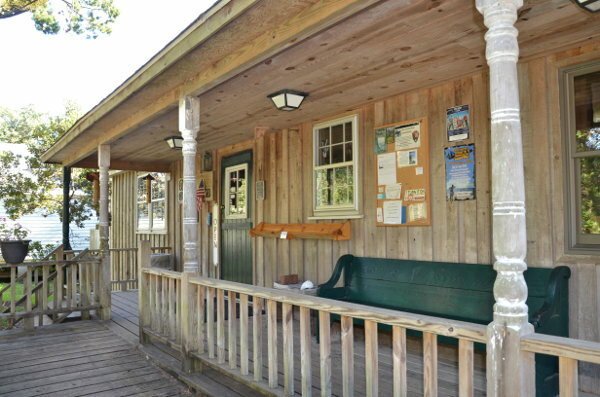 Don't hesitate to sit for a spell on our porch, and enjoy the tranquility of island life. While browsing inside our gallery, you will discover an eclectic assortment of local, regional, and other American made handcrafts, including pottery, stained glass, wood carvings, jewelry, metalcraft, and much more. 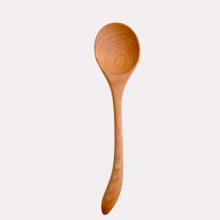 Below are just a few samples of our quality handcrafts. Our latest Ocracoke Newsletter is the story of Beatrice Wells, child evangelist, who preached at Ocracoke in the late 1930s/early 1940s. You can read it here: http://www.villagecraftsmen.com/news022116.htm. 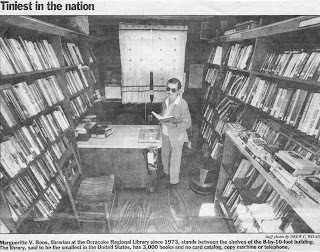 In November, 2015, Ocracoke Preservation Society published an on-line exhibit featuring the history of the Ocracoke Library. The article includes this photo of Marguerite Boos in the 80-square-foot building which served as the island library (and the country's smallest library) for twenty years. 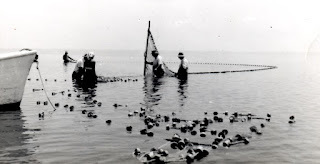 You can visit OPS's on-line exhibit by following this link: http://ocracokepreservation.org/november-online-exhibit/. 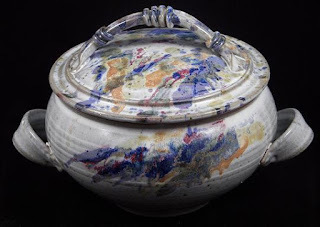 About 200 years ago there lived on Ocracoke Island a fisherman of indeterminate provenance. He was a reclusive figure, preferring to live in a small hut made of driftwood and bullrushes about 5-6 miles from the village. No one remembers his given name, but folks called him "Old Quawk" because, they said, he "quawked" like an old night heron. Old Quawk was a fisherman, often venturing out into Pamlico Sound in his sail skiff when cautious islanders stayed in port waiting for more propitious weather. On this date, March 16, many years past, Old Quawk made his last voyage into Pamlico Sound. Storm clouds were piling up in the darkening sky. Legend has it that Old Quawk defiantly disregarded the warnings of other islanders, raised his clenched fist to the heavens and dared the gods to thwart him, then set out in his sail skiff. A frightful gale churned the Sound into a wild turbulence and swamped Old Quawk's tiny craft. Neither Old Quawk nor his boat were ever found. For many years Ocracoke fishermen refused to go out in their boats on March 16. Even today it's best to be prudent on Old Quawk's Day. There's no telling what the weather gods will dish out on March 16. This late 19th century photo shows lighthouse keeper Enoch Ellis Howard and his wife Cordelia outside the house on the lighthouse property. Notice that the bottoms of the trees have all been painted white. On Ocracoke and other places around the world it was once common practice to paint trees, although the practice is not as widespread nowadays. In the 1950s I remember seeing the bottom 4-6 feet of my Uncle Marvin's trees (on Howard Street) all painted white. I thought it was just for decoration, but have learned that it may protect trees (especially young trees) from insect infestation and from splitting and cracking. I am wondering if any of our readers remember seeing painted trees when they were younger. In June, 2015, I published an Ocracoke Newsletter article about "Rum Running on the Outer Banks." Apparently a few readers missed that article. 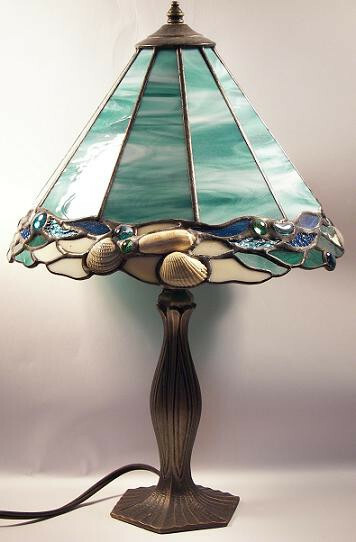 Here is the link: http://www.villagecraftsmen.com/news062115.htm. "My wife is from Appalachia. Her cousin told me a story about how his parents and another couple visited Ocracoke in the early 1950s. 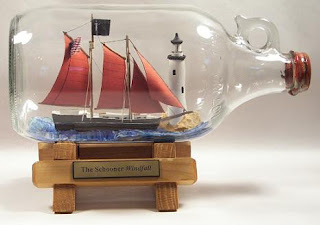 Seems once they got to the island and found a place to lodge in the upstairs of someone's home, the wives, while unpacking, to their dismay, found one of the trunks full of Appalachia's finest moonshine. Being God-fearing women they gave their menfolk an earful. However, after a day or two of observing how their husbands used that bounty to get the best meals, sunset boat rides, tours of the beach and so on, they grudgingly admitted that it was a brilliant idea!" 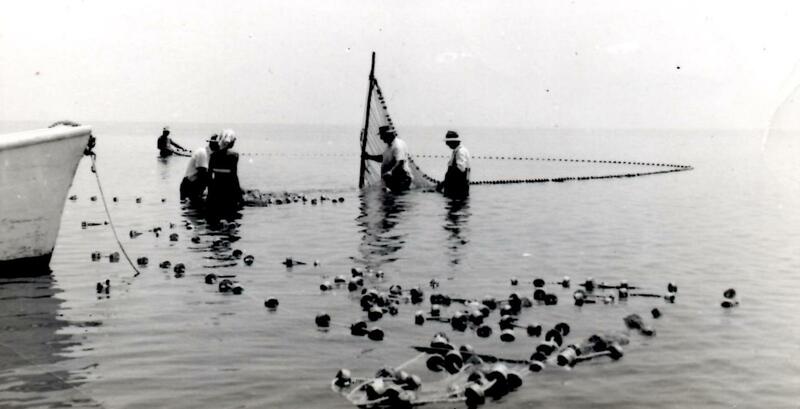 In the 1950s Ocracoke was a dry township, but locals frequently partook of homemade fermented "meal wine." Distilled beverages were much rarer. It was said that if someone laid a hundred dollar bill on the hood of their car, and weighted it down with a fifth of liquor, on the next morning they would find the hundred dollar bill still there, weighted down with a big conch shell. the song mentioned in the Newsletter article about rum running: https://www.youtube.com/watch?v=-xpeeJwR8k0. Warmer weather has arrived on Ocracoke, so spring must be close behind. 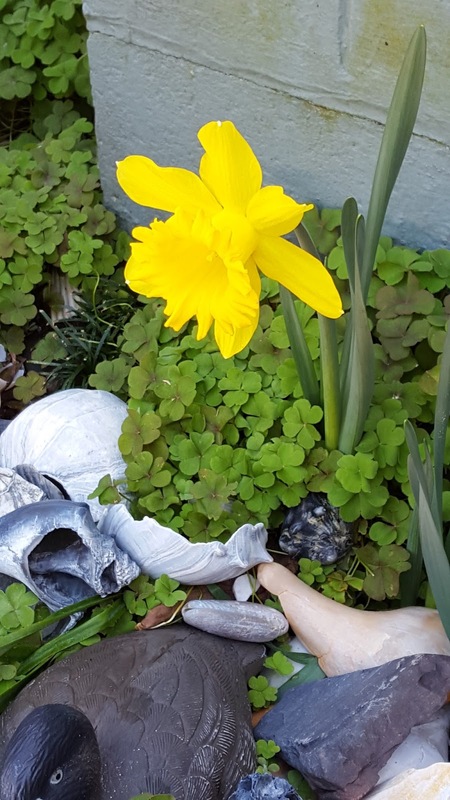 According to tradition, I must post a photo of one of our daffodils. This one, which is in Amy & David's yard, started to bloom a few days ago. Daffodil is one of the common names for the Narcissus plant. According to Wikipedia, "The exact origin of the name Narcissus is unknown, but it is often linked to a Greek word for intoxicated (narcotic) and the myth of the youth of that name who fell in love with his own reflection. The English word 'daffodil' appears to be derived from "asphodel", with which it was commonly compared." 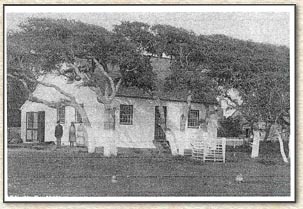 Ever wonder how and when Ocracoke first got electric power? 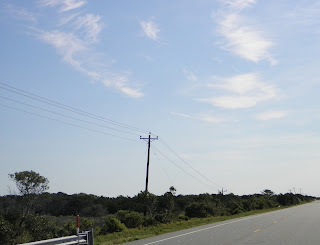 Hint: it was before WWII, and there were no electric wires laid under Hatteras Inlet as there are today. You can find out about this subject at the OPS Spring Membership Meeting Tuesday, March 15, 2016, at 7:00 pm at Deepwater Theater. Heidi Smith from Tideland EMC will be the guest speaker. She will share stories about the evolution of power on Ocracoke and how Tideland came to be our energy provider. Heide will also give us a peek at new energy programs Tideland EMC is working on. In addition to partaking in tasty desserts with friends, you can help support the Ocracoke Preservation Society by renewing your membership or becoming a new member. We hope to see you there! In the past two years, crew members of the North Carolina Ferry System have been involved in four rescues of mariners in coastal waters. On September 26, 2013, the crew of the Motor Vessel Cedar Island rescued two sailors in rough seas near Ocracoke. 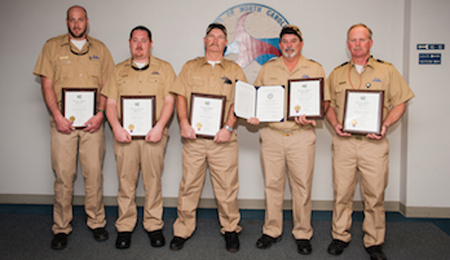 On March 29 and July 4 of 2015, North Carolina ferry crews came to the aid of several men whose sailboats had overturned in the Neuse River. On August 29, 2015, the crew of the Motor Vessel Silver Lake rescued a father and son in Swan Quarter Bay. On Tuesday of last week (March 3, 2016) the crew was honored by the United States Coast Guard for their life-saving actions. Below is the press release from the NC Ferry Division. 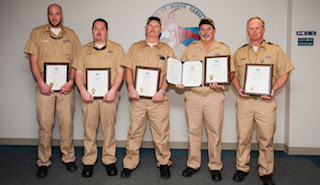 Raleigh - The crew of the NCDOT Ferry M/V Silver Lake was honored today with a Meritorious Public Service Award from the United States Coast Guard for the crew’s actions in rescuing a father and son whose boat had overturned in Swan Quarter Bay. “The bravery and acts of heroism are a testament to the professionalism and caliber of the Motor Vessel Silver Lake crew," said Coast Guard Acting Sector Commander Benjamin Cooper. “The father and son are alive today as a direct result.” The incident occurred Saturday, Aug. 29, 2015, as the Silver Lake’s was on its 9:30 a.m. run between Ocracoke and Swan Quarter. As the ferry approached Swan Quarter, Captain Mark Piner noticed an overturned boat in the water with two people clinging to it. Piner immediately ordered the crew to launch the ferry’s rescue boat, and crew members Daniel Smith and Simon Robinette piloted it to the capsized vessel and pulled George and Justin Peele out of the water and into the rescue boat. After determining that both men were unharmed, the crew brought the father and son onboard the M/V Silver Lake and the ferry completed its run to Swan Quarter. Upon reaching the ferry terminal, crew member Robinette returned both men to their vehicle at a nearby boat ramp. “We are incredibly proud of the Silver Lake crew for its life-saving actions last August,” said Ferry Division Director Ed Goodwin. “All of our crews are trained extensively in responding to emergencies on the water, and it’s good to know how much that training pays off.” Receiving the award today were Captain Piner and Crew Members Smith and Robinette, as well as Chief Engineers Gerry Gillikin and David P. Styron and Crew Member Randy K. Willis. Frank Treat Fulcher was one of Ocracoke's quirkier characters. Born on the island in 1878, he went to sea when he was ten years old. He served on many coastal schooners, was shipwrecked at least once, and then sailed around the world as a mariner on a square rigger. He later became a Methodist preacher. 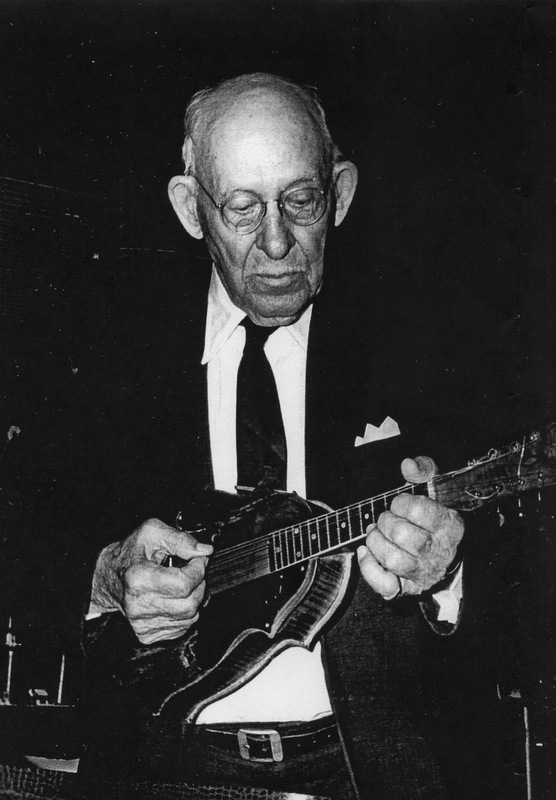 He returned regularly to Ocracoke where he was known for his folksy wisdom and colorful sermons. 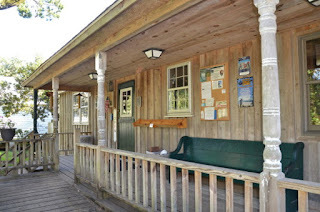 Recently the Ocracoke Preservation Society, thanks to a grant from the Ocracoke Occupancy Tax Board, embarked on a program to add on-line exhibits to its web site. Their most recent entry is the story of Frank Treat's life. You can read Frank Treat's short autobiography, and see more photos, in the OPS website or in Village Craftsmen's May 20, 2011 Ocracoke Newsletter. Pamlico Sound is a beautiful body of water in all seasons of the year. 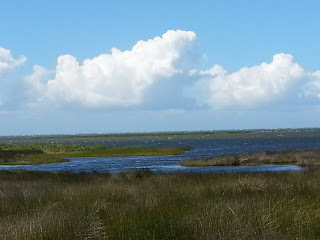 It is perfect for fishing, clamming, swimming, sailing, or, if it is very cold, simply enjoying from a vantage point along the marsh. Yesterday I published a photo of members of the United States Life Saving Service practicing a "breeches buoy" rescue operation on land. 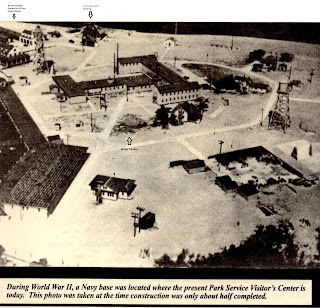 Below is another photo from the Outer Banks History Center. This one shows life savers practicing on the beach with their surf boat. On the extreme left is the 1,000 pound "beach cart" loaded with all of the equipment that the life savers pulled along the surf. 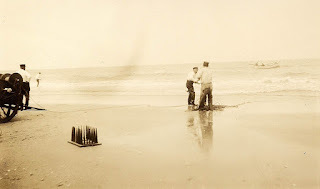 In the foreground is a portion of the "faking box" (with rows of wooden pins around which the shot line was woven in a zig-zag pattern to prevent tangling when emptied beside the Lyle Gun). Rescues were rarely performed when the surf was as calm as in this photo, or the temperature as mild. 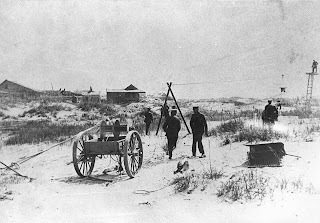 The following undated photo is courtesy of the Outer Banks History Center. It shows members of the United States Life Saving Service practicing their drill for the rescue of sailors aboard shipwrecked vessels. If you click on the photo to enlarge it, you can see the bronze Lyle Gun just below the two life savers in the center of the picture. The Lyle Gun, a small cannon, shot a projectile, hemp line, and instructions to the stricken ship. In a series of maneuvers, sailors on the ship tied a hawser and whip line to a mast, and the other end was secured on the beach. Crew members and passengers could then be transferred to shore by means of a "traveling block" and canvas "breeches buoy" (hanging from a line attached to the stand and ladder on the right of the photo). This photo was probably taken in the late 19th century near Nags Head or on Hatteras Island. Most rescues were performed in gale force winds and rough seas, often in cold winter months. Some required the life savers to risk their own lives in open surf boats. Chapter eight of my book, Howard Street Hauntings and Other Ocracoke Stories, has a detailed description of the live-saving operation. 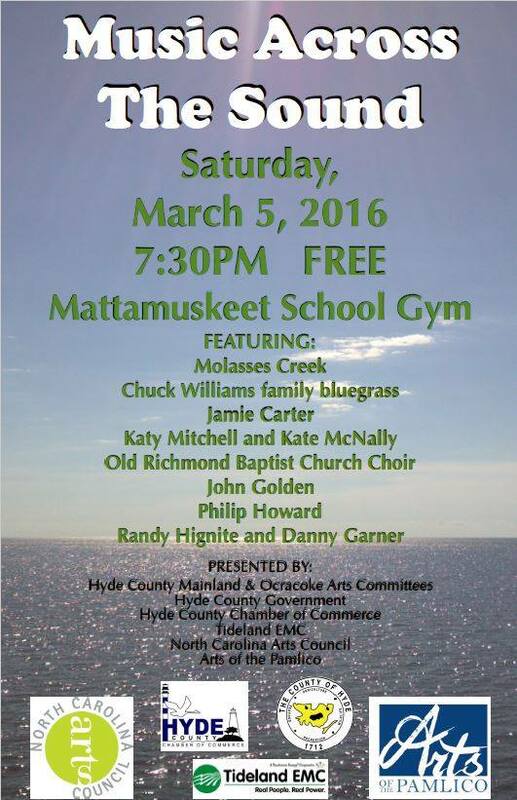 If you will be in mainland Hyde County or close by in eastern North Carolina this Saturday, March 5, be sure to come out for another "Music Across the Sound" event at Mattamuskeet School. This event starts at 7:30 p.m., and is free to the public. Click on the poster to view a larger image, and for more information about participants and sponsors. Did you know that the U.S. Lighthouse Board specified a whitewash recipe for keeping the Ocracoke tower protected and presentable? The mixture was to be applied as hot as possible.